Featuring a silk style purple fabric, this purple shiny sharkskin 3 piece suit from Stacy Adams features the style that brings back the old school when style counts. The jacket has side vents and a regular fit. The pants are pleated and the vest has vee style scoop. 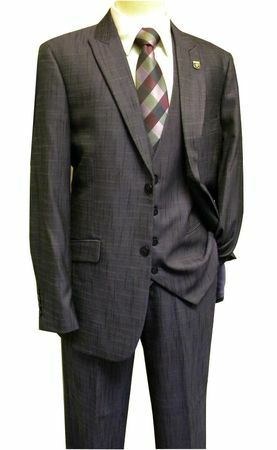 Made of poly/rayon sharkskin. Final Sale item. Sorry, no returns.